Akshay Kumar’s Picture With Suniel Shetty is epic! 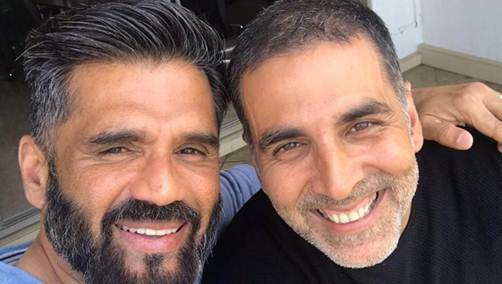 Akshay Kumar recently took to social media to share a selfie with his co-star and one of his long-time friends Suniel Shetty. Waqt Hamara Hai was the first film where Akshay Kumar and Suniel Shetty came together on-screen. The camaraderie between the lead actors stood out and was much loved by the audience. This film paved the way for the actors to come together again and again for some of the most unforgettable films in Bollywood. Now, who doesn’t know the magic of Hera Pheri? Akshay Kumar as Raju, Suniel Shetty as Shyam and Paresh Rawal as Baburao gave us a cult comedy and the characters played by the actors remains iconic till today. A critical and commercial success, the film is about a love-triangle between characters played by Akshay Kumar, Suniel Shetty and Shilpa Shetty. The music of the film was a massive success. Now, who wants to see these two handsome gents back together? We certainly do!